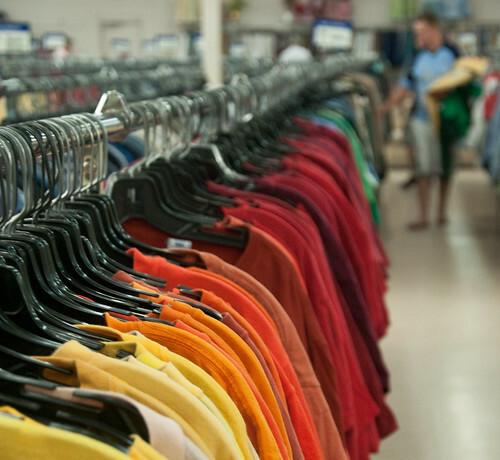 I don't mean to be boastful, but do you recall that $40 polo shirt you bought the other day? The one that you're bound to spill some grease on next week and never get to wear again, thus wasting your $40? Well, I just bought 12 shirts from my local Goodwill shop, enough shirts to last me for the next year, and it only cost me $48. And at those prices, I could care less if I spill grease on them. I used to be a Lands End guy. The catalogue would come in the mail, I'd puruse the mens' section picking out the one or two shirts I could afford, and proudly proclaim that I got a good deal because I knew they would last a couple of years -- not like some other shirts that last a couple of washings, if that! I'd spend $70 on Lands End polo shirts. Yes, they were brand-spanking new, never-been-worn-before shirts, but they were $70. And I would ALWAYS spill something on them, stain them up really good, and never get to wear them after that. Sevety bucks wasted. Like I said, I'm a Goodwill guy now! I needed a leather jacket. Leather jackets are expensive. I bought three from ShopGoodwill for less than $100. Two fit fine, the other was a bit small, so I gave it to my wife. It's her favorite jacket now. All for less than the cost of just ONE leather jacket, brand new! Why all this love for Goodwill all of a sudden? Because it's smart! It's an organization that helps people in need. And it helps people like me, who are stretched financially, to afford good quality, inexpensive clothes. Did I really spend $70 on two polo shirts? You bet, and so have you. Will I ever do it again? No, no, and I mean NO! So, how are you spending YOUR money?